Here's another preview of the 'City Girl' collection. When I saw these 2 images for the very first time, I knew straight away that I wanted to use them together. Oakley just looks like he's looking at Willow with such love and I'm not surprised . . 'what a babe' (hubby's words!) Willow is, all decked out in her finest. Well, thanks for stopping by and have a lovely evening. so in the run up to that, all the DT (links in my sidebar) will be tempting you with previews. Found scrap piece of DP which had 'hey gorgeous' on it which I thought would be perfect and the colours were nice and bright so based the whole card around that by turning it into an easel card. The 'sassy' sentiment is from a Greeting Farm sentiment set. 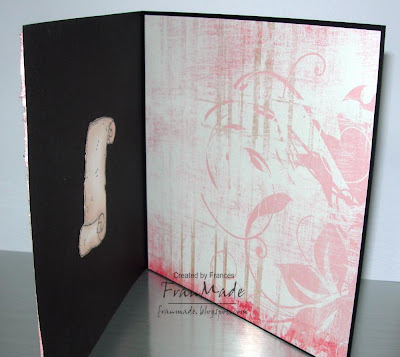 I wanted a fun, free feeling to the card so kept the layout very loose and unstructured with tilted layers and random look to the placement of the flowers and sentiment. I shall leave you with some more shots of the card (all can be clicked on for closer view). Thanks for dropping by (if you're looking for my CCT card it's the post below this one). CCT theme this week is 'Bloomin gorgeous' and is sponsored by Wild Orchid cafts (which is where I go for my paper flowers. Love the choice and the price). I've used another of my uninked pile of rubba, this time a gorgeous fairy from LOTV. Adore the style of these drawings and have just got some of the new ones too to add to my uninked pile! 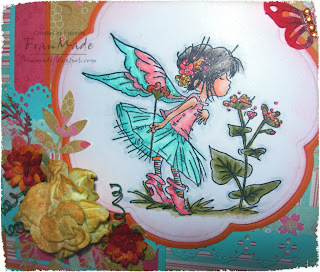 I've used the sketch over on Sketch and stash and have used a fab fairy sentiment stamp from WoJ then just chucked loads of flowers onto it and also lots of sparkle both on the flowers and the image - can't have a fairy who doesn't shimmer now, can we?! 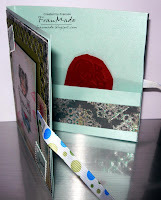 and here's a side view to show you how dimensional the card is - just need to make an envelope to fit it now! Colouring: Copics plus Sakura stardust pens watercoloured on in places to give her shimmery wings, and skirt. 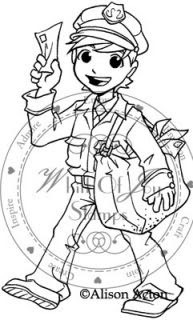 I'll be back with another post later tonight for a WoJ sneek peek :) hope to see you then if not, have a great day. Thought it was high time I inked up some Magnolia stamps as they have been VERY neglected of late - can't even begin to tell you how many of last years haven't seen ink yet :o So I've made a start and used these 2 from the winter kit. 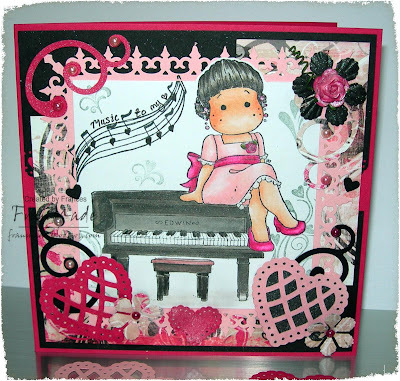 The music note is also a Magnolia stamp (couldn't tell you which release though as it's one of their earlier ones). I have altered it slightly by turning the notes into hearts and adding the text. 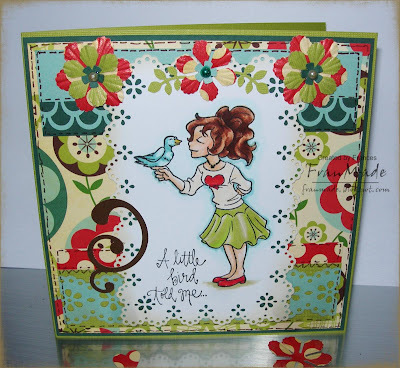 The other swirly heart flourishes around her are from a hero arts set. Well, I did have a stash list but blogger just crashed and I've lost it all and don't fancy typing it all out again! but I've mentioned all of them and everything else is all my usual suspects - Copics, H2Os, lots of punches and couple of embellies! That's all from me for today. See you tomorrow with my CCT card hopefully. Have a good day! 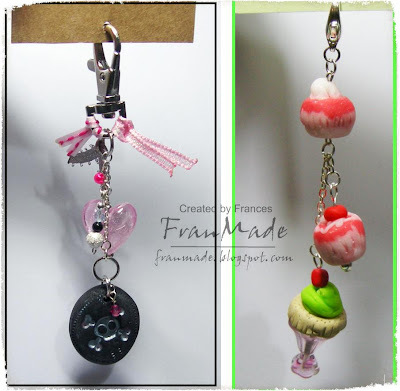 So, as promised, here are photos of the first bag charm dangles I made using the fimo beads I made last week plus some other beads and bits from my little stash of jewellery findings I have now collected :). 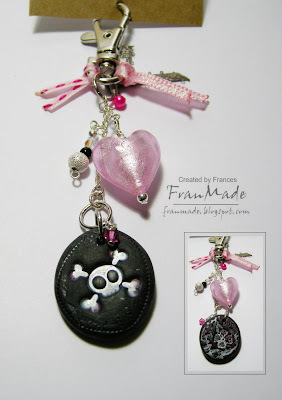 The black and pink one is bigger and the images on the black fimo bead was made by stamping into it - the skull was from a Greeting farm set and the floral pattern was from a lace stamp by Hero arts. Once baked, I just buffed it up with a bit of metallic acrylic paint. The little cupcakes and ice cream one is a lot smaller. 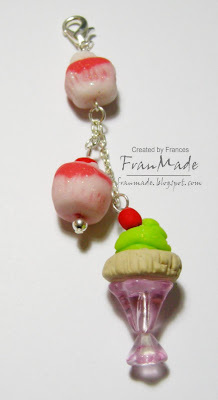 I turned the green midget gem bead into an ice cream sundae by adding some flower cup beads below it for the glass and a red bead on top for a cherry! I gave these to my sister for her birthday at the weekend and I think she liked them! My niece now wants me to make some mini sushi beads and make a bracelet for her as she loves her Sushi. I've seen some fantastic ones on etsy so will have a play and see what I can come up with. 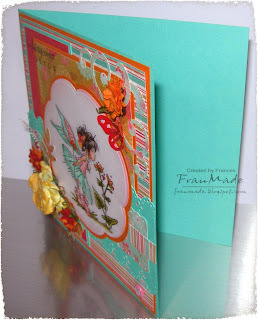 I haven't been neglecting my cardmaking but will save that for tomorrow's post. I used the sketch over on Friday Sketchers along with this lovely WoJ image which was from the winter '09 set of release but works all year round. I've watercoloured with distress inks and twinkling H2Os and gone for a more vintagey look by using some papers from Basic Grey 'Nook & Pantry'. The little calender slips out so can be replaced with another or just left as is. Talking of Jewellery, I think I may have got bitten by that bug now too and also making my own beads/decorations. 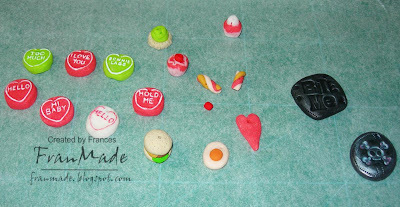 Saw some cute polumer clay beads whilst browsing bead shops the other day - including some fun retro sweets like love hearts etc so I thought it would be fun to try and make my own (used to love plasticine as a kid!) Sooo, I bought couple of Fimo clay bars and had my first play the other night. Here's a quick peek at my first batch of homemade beads, straight out of the oven! 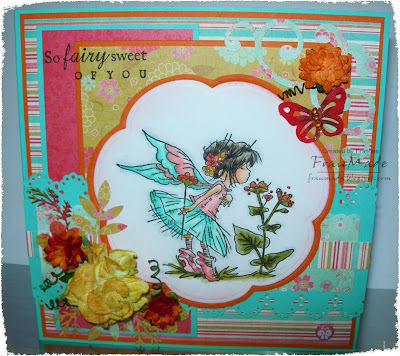 CCT theme this week is 'Fairy fantastic', so time to rummage through all your fairy stamps and images. Went for a typical blk/red combo and threw in some silver and green as highlight colours. 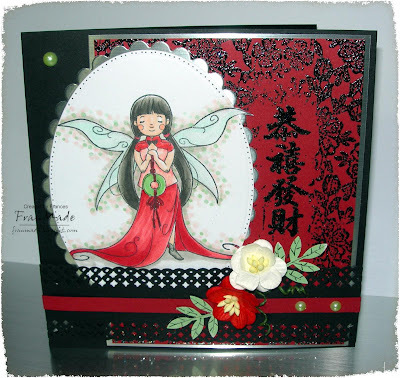 No patterned paper, just stamped & heat embossed a lace stamp & chinese sentiment stamp onto red card using black holographic embossing powder. 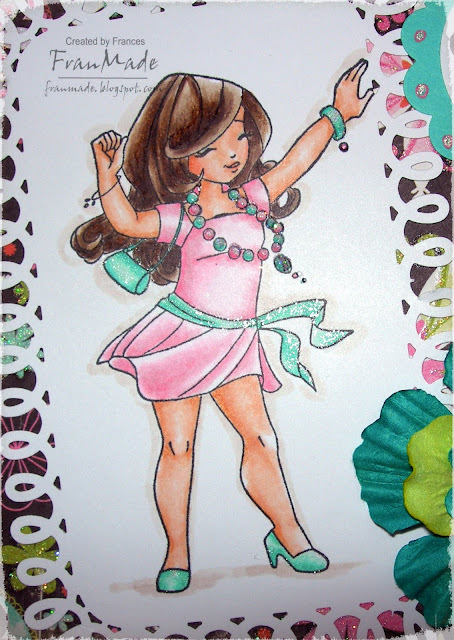 Image coloured with Copics as usual, but then the dotty shading around her was my first attempt at doing this. 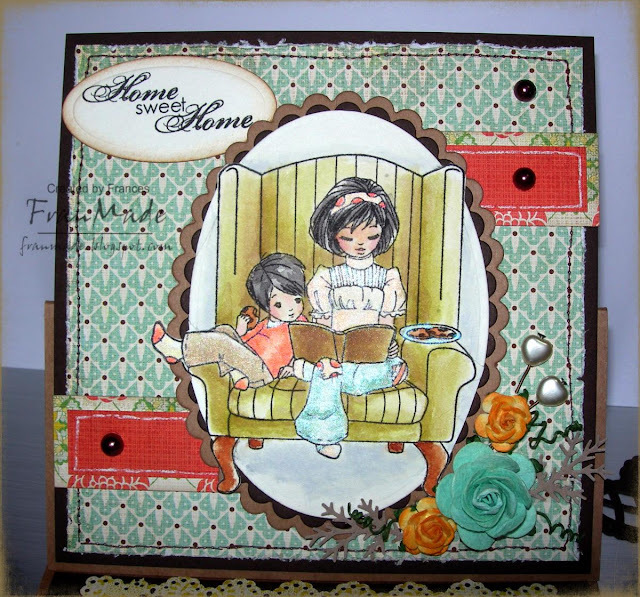 I usually just shade it in with a pale grey or blue copic but I was just blown away by the effect that was achieved with this card by Chrissie whilst bloghopping. Now obviously mine is nowhere near as good (In hindsight, should have gone a bit more dotty but I was afraid to add to much but I know to just go for it next time!). I love the effect and will be using this technique again for sure -that's the beauty of blogs, you get to learn and share stuff to try! Thanks for stopping by & have a good day. 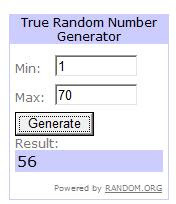 Candy winner . . .
. . . of this is . . .
Congratulations Kim! Please e-mail me your address (my email is on my side bar near the top) and I will post it out to you in next couple of days. Hello! Hope you all had a good weekend. I haven't got a card to show you today as I wasn't in the mood plus I tried something new over the weekend. 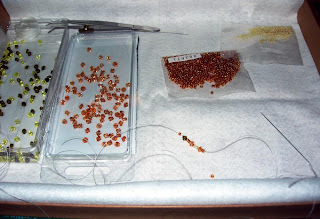 Got a little beading kit whilst I was in Hobbycraft last thursday and gave it a go. It was fiddly but fun. The diagram/pattern looked really complicated at first but once I got going it was quite easy - just like sewing really. Here's my very first beaded bracelet . . Morning! 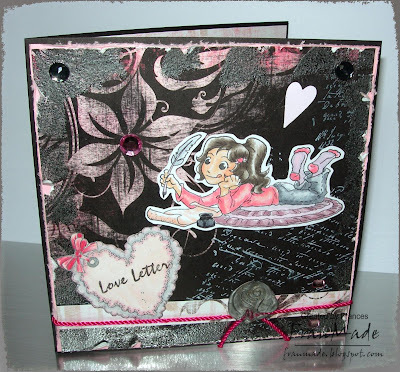 CCT challenge this week is a colour combo 'pink & grey'. So I rifled through my papers and came across this Bo Bunny sheet which to be fair is more black & pink but hey, black's just a dark shade of grey surely?! well, that's my story and I'm sticking to it. Anyway, I've coloured the image with lots of greys and I've added 'gunmetal' grey embossing powder around the edges of the paper and the little heart seal is done using silver wax so there is lots of grey in there. I seem to end up doing collagy type cards when left to my own devices so not much structure to this card - just kinda let it flow. Apart from the embossing around the edges, have also attacked it with my distresser tool, stamped some script onto the paper to tie in with the letter theme, then just added few gems, string and hearts. As the base card is dark grey, I've decorated the inside too - very basic, just used reverse side of the DP and a little scroll stamp on the other side . .
Be sure to stop on over to CCT for more inspiration from the other DTs, not to mention there's sure to be a fab candy prize on offer if you enter (as there is every week). I've got another post below this one - I know, very unlike me to get 2 cards made in a day, no doubt it just means I'll not be able to come up with anything for a few days! Anyway, I'm hoping to get to Hobbycraft today after last week's aborted trip and debacle in the snow. It snowed a little yesterday I'm just hoping that was the last of it - fingers crossed. Thanks for dropping by, have a good day! 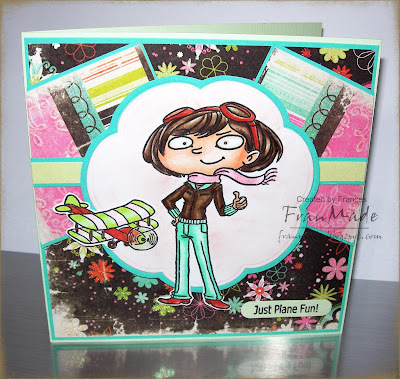 I got the new Kraftin Kimmie stamps from Silly Monkeys and had to ink one up straight away. Thought this week's FS sketch would work great with 'Emelia' and came up with this. Not too happy with my colour choice for the plane but it's done now and think it'll do. I love the sentiments in this set, some of the puns are right up my street. Not much else to this card, as I kept it simple, the only thing you can't see is the dimension to it as the central image is raised on foam pads. 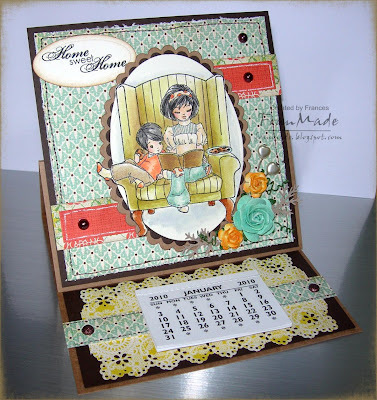 Paper: WeR Memory Keepers 'Tiffany' - I know, I've been using this alot but I'm trying to use up the scraps as I go, still got another 2 cards worth I think . . sorry! As promised I have a little WoJ candy to give away - this 'Charlie Postman' unmounted rubber stamp, from the new Alison Acton 'Happy Mail' collection just released . .
. . which will come in this little folder card (as shown in an earlier post last week) and I will fill it with some metal charms and paper roses too, which I have not photographed. If you would like to be entered into draw, please just enter your name and your bloglink into 'Mr Linky' (NOT in the comments). If you don't have a blog then just link it to this blog. Open to all and I will draw winner next wednesday 20th Jan.
Inked up another WoJ stamp from the 'happy mail' collection and the sketch over on sketch Sat fitted the bill perfectly - although I did run out of room for the sentiment bit and that's not quite as sketch, but close enough I hope! Stamps: 'charlotte kissing pidgeon' - WoJ. sentiment is 1 of those 99p studio G wooden stamps that has a little birdie with it but I just left that bit off when I inked it up. Paper: Cosmo Cricket 'early bird' and bits of card all from my scrap pile - which has grown again and I need to cull it again soon and chuck some out as there's no way I'm going to use it all. Well, the snow's finally melting now that we've managed temperatures over 0! Which is good, as like most things it's only nice in small doses I think! Hope it's warming up where you are and things are getting back to normal (for all non brits, you must think we are useless LOL, bit of snow and the whole country grinds to a halt!) Thanks for dropping by.